Do you find yourself saving a little money only to see it dwindle away over time? Do you attempt to save for financial goals but always seem to fall short? Do you have money saved up but no idea what it’s for? If any of those sound familiar, then I have the perfect solution for you. Whether you have $100 or $100,000, every dollar in your savings should know what it’s to be used for. If your money is currently just “in savings”, when you inevitably use it to buy a television on impulse, it will be easier to rationalize the purchase in your mind later. But what if your savings were allocated to different goals and a television wasn’t one of them? Would your decision-making process change? If your like many others, it would. So how to do go about allocating your savings to different goals? The easiest way to divide your savings is through separate savings accounts. Just look at your financial goals and open up several savings accounts based on those goals. 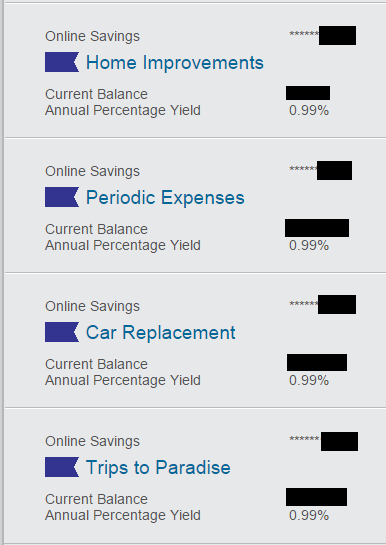 That image is a snapshot of just some of the savings accounts I have at Ally Bank. One of the best parts is that you can name each account whatever you want. This strategy helps you break up your money into goals, which makes it harder to spend the money impulsively. For example, if you had a separate savings account that was for “Little Johnny’s College”, would you want to take money from that account to buy a television that wasn’t budgeting for? You’ll run away from that high schooler in the blue shirt before he can even ask how you’re paying. By simply classifying your savings, you avoided buying something that wasn’t budgeted for. Those are just a few examples of what you could do. It may even be helpful to get creative! Instead of “Vacation Fund”, name the account, “Trip to Paradise”. Take the “Car Replacement Fund” and name it “Set of New Wheels”. Do whatever you need to do to make it fun! The first place you should look is your current bank. Simply ask them if they allow the creation of separate savings accounts that you can give a nickname. If they do, make sure it’s at no additional cost. You don’t want to be paying more fees! If they don’t offer that service, go out and find a company that will. My personal recommendation would be Ally Bank. I’ve been with them for several years and have zero bad things to say about them. Their fees are practically non-existent and they have one of the best interest rates on their savings accounts. For those of you that are curious, I make no money recommending Ally and they did not ask me to write this post. Honestly, I doubt they even know I exist. If Ally Bank isn’t for you, I know CapitalOne360 allows you to create separate accounts as well. You should also check with your local credit union. Many of them also allow you to open separately named accounts. If you’re struggling to save or just don’t know what you’re saving for, you need to start naming your savings.